Today is the Student Staff Conference on the Future of Learning, 10.00 – 3.00, in the MAB. Full Programme available here Student Staff Conference details The themes are to generate discussions around the use of technology in HE and showcase the research by Karin Crawford and Dan Bishop around re-imagining ‘Subject Committee Meetings’. Professor Scott Davidson, DVC Teaching Quality and the Student Experience, will open the event at 10.00 in the Jackson Lecture Theatre and I’m leading one of the parallel discussions at 11.00 (in MB1013) around digital literacies in particular the use of social media. During the session, I’ll be referring to the documents below (with some copies to give away). I’ve also included the presentation slides. Rory Cellan Jones, BBC Technology Correspondent, went 24 hours without the internet, concluding he was unable to function without being hooked up to the online world. Most of those he spoke to during this time agreed with him. Later, on reflection, Cellan Jones concluded disconnection might not be a bad thing after all. I have sympathy for this view. At Brayford this morning the internet was dodgy for about an hour and then disconnected for ten minutes to be fixed. That was bad enough. At the time. But what disconnection highlights is our addiction to being online in general and to social media in particular. We have become dependent and it has happened in a very short time. In less than a decade the internet machine has taken over. What would Christopher Lasch have to say? In his book The Culture of Narcissism he claimed American society was out of touch with past and future and overly absorbed in the present. People were afraid of nothingness and, in order to fill the void of themselves, had become totally focused on the moment seeking immediate self-gratification through consumerism or entertainment. In an echo of Neil Postman’s critique of mainstream US television, everyone was in danger of amusing themselves to death. Both Lasch and Postman were wOiting before the internet revolution of the late 20th and early 21st century. The internet is probably the biggest void filler of all. It enhances opportunities to block out reality and encourages retreat to a parallel digital universe, one which responds to the screen swipe or a key click. The more we become dependent on accessing information online, and living out our lives via digital versions of social forums and media, the greater the risk of being unable to function in a disconnected world. Adopting an hour a day or a day a week when the internet is turned off might not be such a bad thing after all. The Council for the Defence of British Universities have formed a coalition to defend universities against the erosion of academic freedom and the marketisation of higher education. They are highlighting, among many things, the lack of space in the curriculum for ideas. Maybe ‘higher education’ should be rebranded as ‘wider education’. The goal of employment is valid but not at the expense supporting students to think creatively, critically and to reflect – preferably through exposure to different ideas and concepts behind a broad range of arts and sciences. My first degree offered a wide mix of subjects all under applied social science. Modules included introductions to philosophy, criminology and psychology and the examination of various sociologies behind work, gender and education. This eclectic mix offered multiple tasters of different ways of seeing the world; it enhanced the experience of getting to know yourself and the difference you wanted to make in the world. If it hadn’t been the late 1980s when colleges and polytechnics were merging with universities I might never have been there. I left school twenty years before – dropping not so much out of education as out of life. When it came to defining widening participation students from ‘non-traditional’ backgrounds I ticked every box on the page and probably a few more which hadn’t at that time been invented. Times are hard. I accept that cuts have to be made and budgets squeezed. For some people this is the attraction of open education but we need to avoid the danger of marketising openness. Open access has the potential for broadening knowledge; to dip in and out of a wide subject range and taste an eclectic mix of disciplines – which applied social science used to do so well. One possible way to challenge the move to marketisation might be a first year module on diversification and digital scholarship. This could include weekly tasters of the very best in topics as wide as philosophy, architecture, engineering, drama, chemistry, poetry and social justice. Adopting the principle of Ted Talks, it would show how the internet supports critical reflective practice, for example searching and evaluating online content, while also introducing the concept of learning for life. Although the module would be delivered face-to-face, it would provide guidance to quality open educational resources and courses freely available at places like the OU Open Learn and Coursera. The open education movement is attracting some of the best educational institutions and educators to share their practice online. The principles of free access to learning are in place; we now need to encourage wider excitement about open education opportunities. Openness need not be a substitute but an additional strand – one which could enhance the learning experience for all and offer hope for a return to some of the best of traditional attitudes to learning in these challenging times. 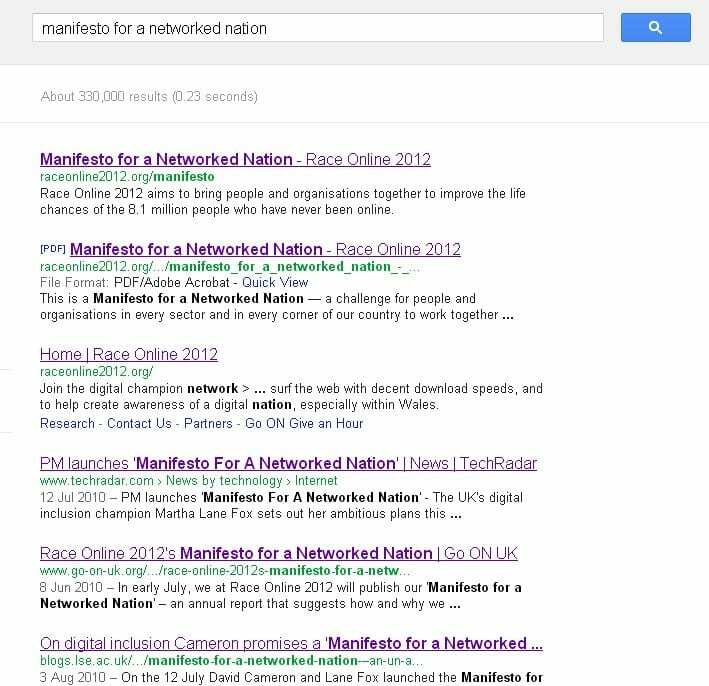 Go On is the replacement for the Race Online 2012 website, designed to champion digital inclusion, but none of the content has transferred across, including the Manifesto. This is unfortunate. It’s now difficult to find ‘official’ reference to those sectors of the population considered up until recently to be digitally excluded. Early research data can be found in the Labour government’s Digital Britain reports; these can still be found in the national web archives. The Manifesto has vanished. It’s not the first time I’ve had problems revisiting content online. Last year a new report targeting ‘hard to reach’ sections of the population divided digital exclusion into three categories; young, old and those in between. It rightly identified cost and motivation as drivers but omitted disability or assistive technologies, which cut across all age ranges and constitute a major cause of exclusion from increasingly digital lifestyles. This ‘hard to reach’ document is currently living up to its name. In George Orwell’s ‘1984’, Winston Smith is employed as a government bureaucrat tasked with rewriting history. What was true one day was changed the next, along with all references to the event. It’s not a fictional fancy to see how those with the relevant levels of access and controls could write the scripts which alter history at the click of a key. Now, if anyone can find a digital link to the manifesto…. 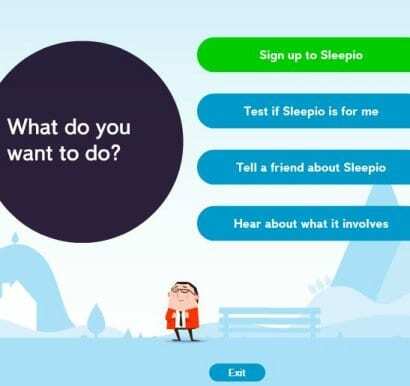 Sleepio is an online sleep improvement program based on Cognitive Behavioural Therapy. The site includes videos hosted by Vimeo and they all have the standard user control bar with stop, play and pause buttons enabling the user to – stop, play and pause. This makes all the more frustrating that the Sleepio animated environment itself has none of the these essential components. The only way is exit. You can’t jump back to listen again, increase the animation text size and there are no alternative format such as subtitles, captions or a transcript. 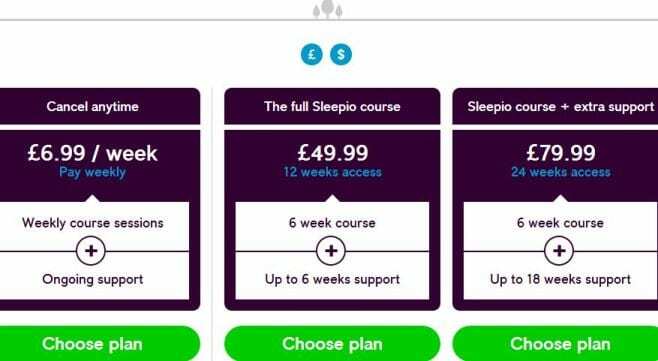 Sleepio wants your money. There are a number of ways to pay for the program. Costs include an online community and online tools, all of which appear within the animation format. But it is only available to those with the prerequisite means of access. This site is an example of the inaccessible nature of the world wide web/internet and how discriminatory online environments are becoming. This isn’t a case of being pedantic, or poor use of time in scoping the images on the site, it’s about fundamental equality legislation which is increasingly invisible in the design and delivery of online information. 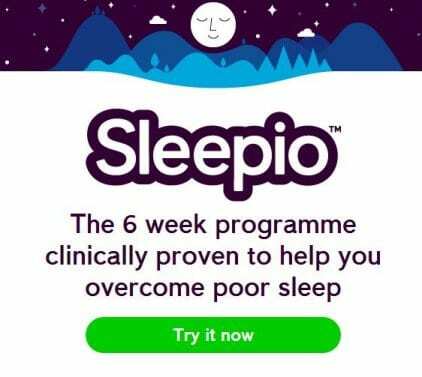 The Guardian today carries an article on insomnia which is a thinly disguised advertisement for the Sleepio product. Maybe the Guardian itself should adopt a position of greater responsibility and refuse to promote websites which fail such basic accessibility requirements. It’s time someone in a position to be influential addresses the issue of digital literacies which fail to address digital exclusion. 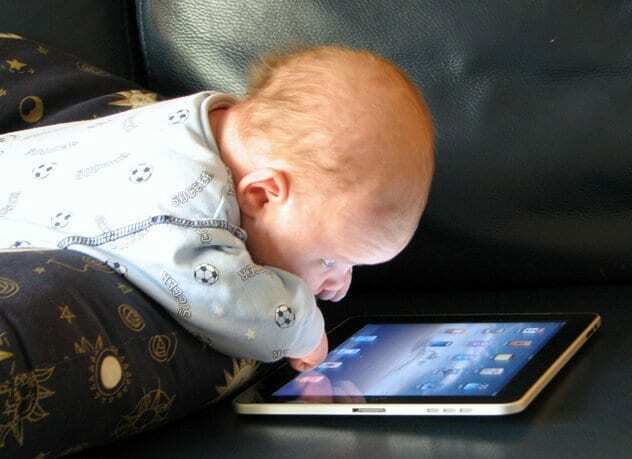 Perceptions are shifting with regard to digital literacies. The phrase is now taking on much broader professional and public dimensions as well as personal ones. Recently the Guardian Higher Education Network published twenty ways of thinking about digital literacy. Helen Beetham calls for ethical responsibilities in environments where public and private are blurred. This is the professional aspect of digital literacies; recognising the need for multiple identities and knowing where to draw the lines between them. Presentation of self online to family and friends is different to the presentation of self in work environments. Digital interaction with clients, customers and service users differs from interaction with students, colleagues and management. Understanding the permanence of digital footprints and the speed at which digital content can be taken out of context and spread across world wide networks is too easy to underestimate, as is the unpredictable behaviour of strangers online. We don’t know what other people will do with our content making it critical to think before uploading and bear in mind the limitless breadth and depth of digital landscapes. Sue Thomas says nothing exists in isolation. We need to consider a range of information and communication media and adopt holistic and inclusive approaches to transliteracies. However, inclusion means more convergence across than multiple forms of expression. Inclusion is the public aspect of digital literacies. It refers to the dichotomy of digital practices where the technology which enables access can also deny it unless steps are taken to ensure barrier free ways of working. The university of the future needs to be many things and one of these is the producer of students who are aware of the parameters of digital divides and know how to recognise and challenge instances of digital exclusion. The triad of the public, the professional and the personal lies at the core of higher education with its focus on critical reflective practice and social responsibility. If the relevant and appropriate digital literacies for a digital age are to be embedded as whole institution strategies then their public, professional and personal dimensions must be recognised and supported too. Google and me? We’re in it for the duration. Googles privacy laws affect all users of google accounts. It’s impossible not to be a user if you have an android phone or tablet or been invited to work collaboratively by a colleague via google docs. Inspite of recent media claims the new information sharing systems break European law on data protection, Google has gone ahead with plans to target concentrated advertising based on individual interests and search history. No matter how small the garage or spare room you start out in, most people buy out to capitalism in the end and advertising is how Google makes money. From 1st March  – more than ever before – we’re all products to be bought and sold with our worth based on information given away online. Random advertising is one thing but this is getting personal. We’re all now being followed with adverts for places we’ve been to online. As soon as we enter the google domain we are recognised  only of course it isn’t us,  its our digital transactions the google sharing machine is interested in and how best it can persuade us to spend spend spend. If you read the new privacy regulations you’ll have seen the rationale that google wants to understand what you’re searching for and get those results to you faster. Carry on aggregating information like this and google will know your visible life better than you know yourself. Once more there are echoes of Orwells insightful vision of the years beyond 1984  where ‘thoughtcrime’ might be the only privacy we have left. It’s too late to turn back but why would you want to? Isn’t Google actually making your life easier? Can you imagine no longer having instant information in seconds? No longer accessing the affordances of the Internet without leaving your home? Digital connections are addictive and, if digital footprints are the price we pay to google for enabling this, then I think I can accept that. Nothing has really changed. We were always tracked and recorded and it’s naïve to think it is something new, it’s just become more intense through increased linkups between programmes in the google family. Information is power and it works both ways. Check out your relationship with google. Log into your google account and go to the latest information on data sharing, visit the dashboard to review the places where you and google have connections and check your default account settings; many of these can be turned off. If you really dont want to stay with google there are still alternative ways to reconstruct your online life such as bing, mozilla, safari ect – if you can be bothered to start all over again. Personally I accept I’m tied into google. I like the convenience of my online life. Google and me? Its a long term relationship and were in it for the duration. If you haven’t heard of SOPA today is a good time to look it up. Try Wikipedia today (18 January) and you will be directed to information about SOPA and PIPA instead. 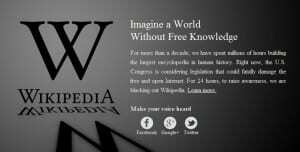 Briefly the 24 hour blackout by Wikipedia and a number of other web presences is in response to proposals by the US Congress – the Stop Online Piracy Act (SOPA) and the PROTECT IP Act (PIPA) – which are designed to control user generated content. This is allegedly about infringement of copyright. Instead of reviewing existing copyright legislation in the light of an Internet age, the media giants have chosen to reinforce their monopolies with a cast iron boot approach. This directly opposes the original ‘openness’ of the Internet while hiding behind claims of piracy and thievery aimed at users who are refusing to be customers. Google, Twitter and EBay are also allegedly opposing this legislation although not with Blackouts – maybe they should – but at least two of the three carry advertising. The fear is the US will have the power to control information and close any websites which contain disputed copyrighted materials. Should it come about I suspect DRM will inevitably be extended as commercial companies use this as an opportunity to protect their brands and products. Capitalism is fighting back and the only surprise is that it has taken this long. There are two issues; firstly the debate over copyright itself and secondly the exposure of the frailty of our digital connections. We take them for granted but they are more vulnerable to attack than we realise. Once the ways and means of imposing controls begins then the Internet will become just another commodity and all its potential for democratic access will be lost. These attempts to control the Internet should be opposed. For more information see See Stop SOPA Now! by Dan Gilmour and Wikipedia Blackout Looms b Mark Sweeny. Keynote Two, with Jane Hughes from Wolverhampton University, addressed the role of technology in teacher education programmes, suggesting there is not enough support for acquiring the digital literacies essential for learning in a digital age. In an echo from the first keynote, Jane reiterated the requirement for educating citizens of the future. We need to be equipping students for living and working in a digital society. Inevitably this vision of adopting brave new digital worlds is countered by the risks involved in making changes in the current ‘risk-averse’ climate. Also raised was the lack of time and institutional support for moving to new digital ways of working. It’s something of a conundrum because on the one hand there are the advantages of digital engagement but on the other there is the short supply of ‘technologists of the learning kind’ and an even shorter supply of funding for development. Teacher education programmes may need to incorporate digital learning but teaching staff also need an informed basis for adopting new digital ways of working. The challenge of Web 2.0 tools can be a steep learning curve. Not only do you need to learn through personal application which takes time, it also requires the paradigm shift from students as consumers to students as creators and collaborators in their own learning experiences. It was interesting to hear several references to ‘Student as Producer’ t the conference where the phrase was being aligned with those digital ways of learning which support student participation in the learning process. The phrase Blended Learning Advisor was popular as were calls for an approach which begins with existing practices; looking at how technology can enhance through the language of ‘as well as’ rather than ‘instead of’. A clear message was for staff educators who are the users of technology to take the lead, rather than the tied and dyed technologists who may not have the necessary pedagogical frameworks. There were lots of examples of technology being raised and praised but not always in a scholarly way. This is where teacher education programmes can make a real difference and again ‘Student as Producer’ comes to mind with its ‘Digital Scholarship’ strand. Overall was the recognised need for an infrastructure which supports the training and developing of digital literacies. These would include the confidence and competence with using and applying a range of Web 2.0 tools and selecting them appropriately to support digital modes of inquiry, collaboration and authorship. I liked Jane Hughes analogy of a jigsaw approach to learning because this I how using Web 2.0 tools can appear. A workshop led by Sue Buckingham and David Walker looked at social media for developing a professional learning network. It demonstrated the value of digital ways of working alongside the fear this can evoke in the uninitiated. The sheer number and variety of tools can be an insurmountable barrier. I’ve been dabbling for some time but hadn’t come across a Twitter Fountain or Drigo, Quora, Nefsis , VoiceThread or Peerwise. It’s this proliferation of content which is paradoxically inviting and threatening at the same time. However, engagement is often initiated in unexpected ways. It was in this workshop I heard the best advice. Some one said they didn’t want to use Twitter to talk about breakfast but having gained some funding, and something to talk about, they were experiencing the value of the networking tweeting can offer. It’s this experiential approach which can be the most useful key to unlocking some of the cognitive barriers. Social media can be like finding a tree in a forest. Where do you begin? There are so many possibilities. As a result, digital divides on campus are inevitably widening. There is a real need for more bridges and teacher education programmes, where the lines between staff and students become blurred – as the collaborative and creative possibilities of social media already blur distinctions between teacher and learner – may be one of the more appropriate places to start building.